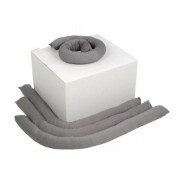 Economical Maintenance Absorbent Socks, in lengths of 1.2 metres and supplied in handy dispensing boxes of 20 socks. Used to absorb and retain water, oils, coolants and mild chemicals. Ideal for larger spills and positioning around machinery. Each box of absorbent socks will absorb up to 70 litres. These maintenance socks are suitable for use in commercial or industrial premises because of their high absorbency rates. Each sock is 8cm in width, meaning they can easily be deployed in tight spaces. Click to view our full range of Absorbent Socks or Water Absorbent products. Super Absorbent Socks supplied in a handy dispensing box of 20 pieces. 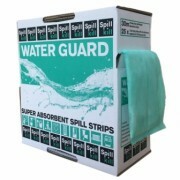 For absorbing water, oils, coolants and mild chemicals. Each absorbent sock will absorb more than 12 times its own weight. Absorbency potential of 110 litres per box. 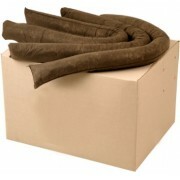 Economical Maintenance Absorbent Socks, in lengths of 3 metres and supplied in handy dispensing boxes of 8 socks. For leaks and spills of water-based liquids in retail and industrial environments. Each flat strip absorbs up to 3 litres. 25 flat strips per box.